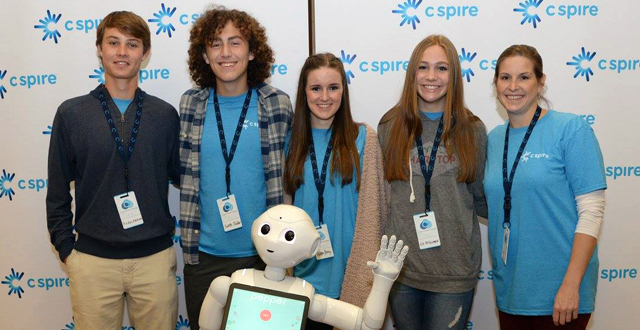 Pepper the humanoid robot visited and even danced with JA Upper School students Preston McWilliams, Burkette Moulder, Ashton Berry, Kit McCormack, and teacher Sarah Shaw as they participated in a coding competition. C Spire hosted its second C3 high school competition at its headquarters one day before national S.T.E.M. day. The C3 program features a computer coding challenge that students work on with the help of a C Spire employee and an adviser from their school. The students solved a series of puzzles that grew more difficult as they progressed. Competing against 29 other schools, our students placed within the top 10 teams at the event. “It gave them exposure to coding,” said Shaw, “and kind of opened their eyes to that field and what’s available and how it works.” The all-day competition is designed to show students the career options available in tech-related fields like computer science and information technology. C Spire hopes to help students discover the world of coding as a gateway to a career. Jackson Academy was represented by three senior students in the 2016-2017 C3 competition. Only 13 teams participated a year ago. As the program has already grown to involve 30 schools, JA students who participate in the future can anticipate friendly rivalry.